You can find Learning Express Library on the Library's Resource List. Look for Access Online Practice Tests (in the center of the page) or Learning Express Practice Tests (in the right-hand column). You can also click here to access it directly. In order to view and take the practice tests, you will need to sign up for a free account. It’s easy! At the top of the screen, click on Sign In/ Register. Then click on Register and create your own username and password. The nursing entrance exam practice tests cover material found on the HESI, TEAS, RNSAE, and APNE tests. There are two ways to search for nursing entrance exams. 1. In the middle of the page, click on Career Preparation and select Prepare for an Entrance Exam. Then click on Nursing School Practice Entrance Tests. Select the desired test and click on Start Test. 2. Type nursing school into the search box at the top of the screen. 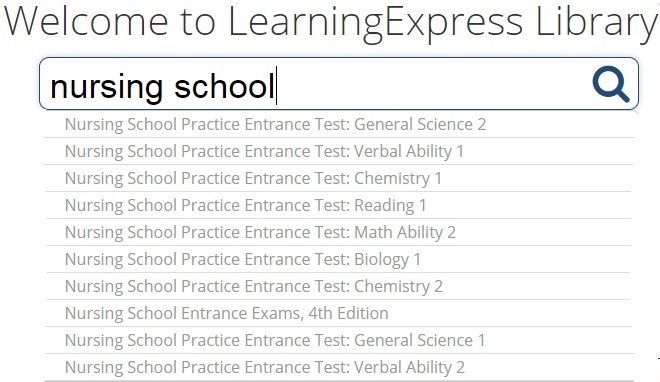 The list of nursing school entrance tests appears below the search box. Select the desired test and click on Start Test. The career preparation section includes practice tests for NCLEX-RN, NCLEX-PN, and Nursing Assistant/Nursing Aide exams. There are two ways to search for nursing licensure/certification practice tests. 1. In the middle of the page, click on Career Preparation and select Prepare for an Occupation Exam. Scroll down and click on one of three Nursing options. Then select the desired test and click on Start Test. 2. Type NCLEX-PN or NCLEX-RN into the search box at the top of the screen. The list of NCLEX practice tests appears below the search box. Select the desired test and click on Start Test.